The last forty-eight hours have been interesting, to say the least, in Ramapo politics. Since former supervisor Christopher St. Lawrence’s conviction on federal securities fraud charges last month forced his resignation, Deputy Supervisor Yitzchok Ullman has been serving as interim supervisor. In a hastily called special meeting on Monday night, the Town Board appointed New Hempstead Mayor Fred Brinn as supervisor. However, before the ink was even dry on the resolution, the Town Board called another special meeting for Tuesday afternoon. At the second special town board meeting in as many days, the Town Board rescinded the resolution appointing Fred Brinn as interim supervisor. Then, Councilman and Acting Supervisor Ullman, resigned his seat on the Town Board. With only three town board members present, the board then unanimously voted to appoint Yitzchok Ullman as supervisor. Newly appointed Supervisor Ullman’s first order of business was to fill the vacancy caused by his own resignation from the town board. 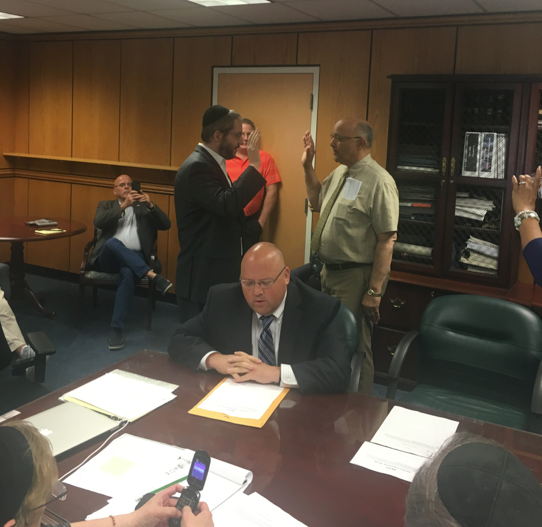 In filling the vacancy, Supervisor Ullman appointed New Hempstead Mayor Fred Brinn as councilman, effective June 26, 2017. The Town Board is now made up of Supervisor Yitzchok Ullman and Town Councilmen Patrick Withers, Brenda Hogan, Michael Rosman and Fred Brinn (effective June 26, 2017). This is the make-up of the town board for the rest of 2017. Fred Brinn will be required to resign as Mayor of New Hempstead to serve as councilman, which will shake up the village board in New Hempstead. Now, with election season upon us, the fun really starts. There are currently three people that have confirmed they are running for town supervisor. Local attorney Michael Specht and businessman Scott Goldman have announced they will seek the Democratic nomination and will face off in a primary in September. Republican Bill Weber is the only announced candidate on that line. Patrick Withers has publically stated he will not seek re-election to the town board and will likely focus on running for other elected office. Withers has fallen out of favor with local politics since he agreed to testify for the prosecution in St. Lawrence’s corruption trial. There will be two seats up for election on the town board now. One to fill Withers’ seat; and the other to elect a councilman for a full-term for the seat now, (or soon to be) occupied by Fred Brinn.